This easy to make Lasagna Soup has a surprise in the middle! I know, this looks like every other soup I love to make…but this one is different. It’ has a secret….a yummy, gooey secret. Shhhh, come closer, let me whisper in your ear…it’s called YUM! A scoop of yummy, gooey goodness lies underneath the quiet tomatoey exterior and it is heaven my friends. I can hardly wait wait for my fellow soupateer Jamie to try it. She is hooked on my Gnocchi “crack soup” but I this might just become her new addiction! Let me know Jamie! So what exactly is this secret yum you ask? 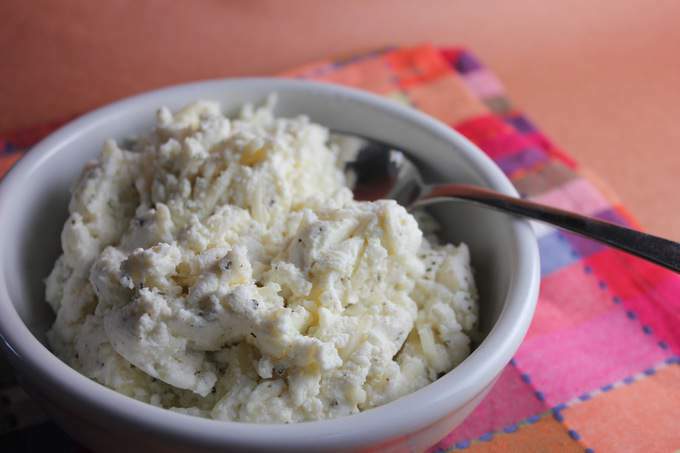 It is a scoop of ricotta cheese that has been mixed with parmesean, a bit of oregano, salt and pepper. (make your own ricotta if you have an extra 10 minutes). 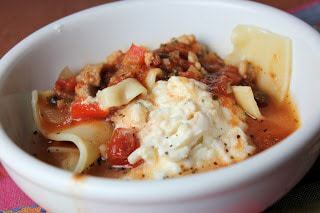 You add a dollop to the bowl, ladle the soup over and top with mozzarella! What kind of pasta? For this photo I used broken up lasagna noodles and it worked pretty good but you might find it easier to use a rotini type pasta…up to you, you still get the same results. I recommend boiling the pasta separately then adding to the each soup bowl. Normally, I’d say…whatever… just dump it all in the pot, but this soup is pretty thick and it’s hard to get the pasta too not get mushy. 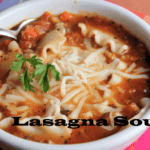 A easy to make soup with a surprise in the middle! Brown and crumble chicken sausage in large dutch oven . Remove from pan and set aside. Boil water for pasta. Heat olive oil to the same pan you cooked the sausage in and add onion, red peppers and saute until onions are soft. Add garlic and parsley, saute for another 2-3 minutes. Add the crushed and diced tomatoes, along with basil - cook 5 minutes. Add broth and cooked sausage. Season with salt and pepper to taste. Simmer for 15 minutes before serving. Meanwhile back at the yum station. Mix together the ricotta, Parmesan, garlic powder, oregano, salt and pepper to taste. 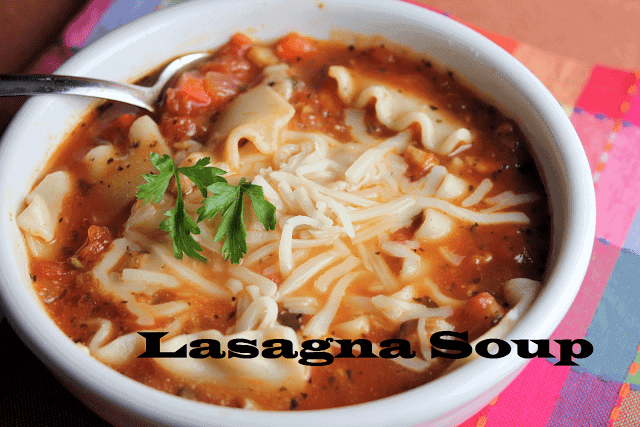 Add a dollop of yum to the bottom of a soup bowl, add your pasta and ladle the soup over it. Top with mozzarella and serve! Yummmmmm!